The emotion of fear is a gradient scale that starts at simple, garden variety “worry”, at the lowest level and goes up to a high level of terror. At the highest levels of fear the body will literally shut down. The emotion of fear is built-in to the body from a long time back as a survival mechanism (the fight-or-flight response). If you have a mental fear the body will respond. Any real or imagined threat to survival can produce this response. However, possibly having less money (which is a survival point in the current society) is not likely to cause death. But many people will get a mental and physical reaction to being laid off, fired or receiving less money that is not much different than if life itself was about to end. If there was ever a question about stock market prices ever being based on anything other than greed and fear that question had to have been answered in the past two days. Oh-my-god-congress-didn’t-pass-the-bailout-bill-sell-everything. Good-news-it-looks-like-they-will-work-it-out-my-stock-is-valuable-again. This isn’t the end. The four horseman are not mounted and riding – I make that statement fully realizing that folks wearing suits who are on TV or work for the Federal Government are saying this is the worst possible situation. Blah, blah, blah. In case you missed it over at Bloodhoundblog, see this for a good laugh. This is only about money. Money that was spent by people who didn’t earn it and who didn’t have it. One of the primary laws of finance is that income must be greater than outgo. Sounds simple. So simple it is routinely ignored: by individuals, companies and governments. The United States is the richest, most powerful nation on the face of the earth. More so than any nation has ever been in all of recorded history – even Rome, when all roads lead there. And yet, our country – with all of it’s riches and all of it’s resources has been spending more than it has been earning. The current “meltdown” is just the house of cards that was there all along, falling down. You can’t lose what you didn’t have. We haven’t “lost something” so much as we discovered we didn’t have something. To paraphrase Winston Churchill’s statement on democracy, the bailout is the worst possible solution, except for all the others. Some say if we don’t do the bailout we could have a depression. Not a recession, a depression. Truth is we could have a giant recession or even a depression if we do the bailout. And I’m writing this to make you feel better. It is just money. That’s all, money. No matter what happens, it isn’t the end of life as we know it. You want to survive. Me too. A simple way to accurately predict how a person will behave or fare in the future is to look at their past pattern. How did they do before? How do they tend to handle things? Do they tend to screw things up no matter what? Or do they tend to land on their feet – always finding some way to make things go right? That is always the ultimate test of any being: The ability to MAKE things go right. Not “are things right? The ability to make them right. Don’t you usually so just that? So what makes this all that different? The suits from the government and TV yip yapping about this mess like they know what they are talking about? If they knew what they are talking about we wouldn’t have this mess. No no. It isn’t that I have faith in the people “fixing” this – it is that I have real faith and confidence in man’s survival drive – your survival drive. Something really bad? September 11th, 2001, New York City. Yet, here we are. If you insist on having something awful to worry about at least have the good sense to move it off of the subject of money. Money does not equal life. Worry about (I’m not really wanting you to do this!) World War III. This small little planet is composed of an anarchy of nations armed with nuclear warheads. Potential mid-east conflicts alone could bring about the end of life as we know it. If you must concentrate on “something awful” – use that one. But let me suggest, if you have managed to make it through the past few weeks without losing sleep over that one – skip the bailout, as well. The question, what turns your dial isn’t nearly as important as who. 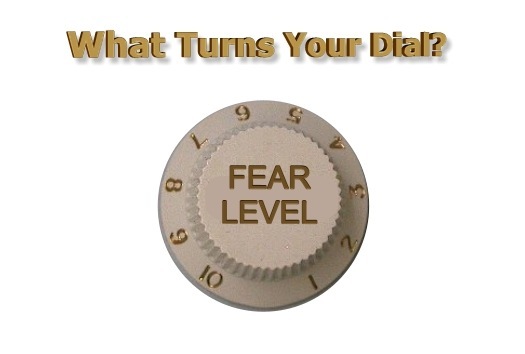 Who turns your dial? And hopefully, the answer to that question – at least most of the time – is you.